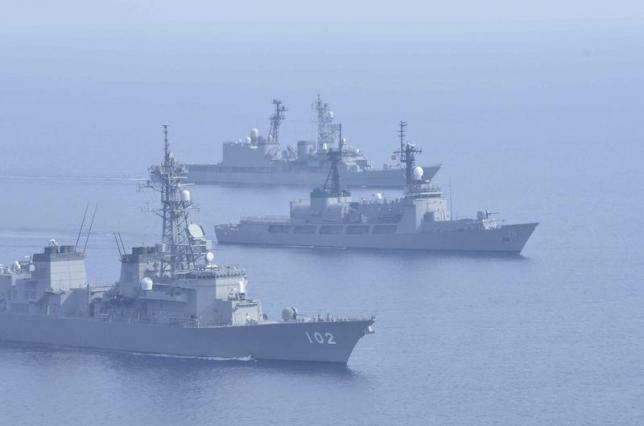 WASHINGTON – Japan’s top military commander, Admiral Katsutoshi Kawano, said on Thursday he expected China to become increasingly assertive in the South China Sea and it was possible Japan would conduct patrols and surveillance activities there in the future. Speaking in Washington, Kawano said there had been “talk” of Japan conducting such patrols in the South China Sea, including anti-submarine activities. “But our position on this is that we consider this as a potential future issue to be considered depending on how things pan out,” he told the Center for Strategic and International Studies think tank. Kawano earlier met with his U.S. counterpart, General Martin Dempsey, chairman of the Joint Chiefs of Staff, and discussed implementation of updated bilateral defence guidelines agreed this year, a joint statement said. Kawano said he expected China to become more assertive and seek to expand its reach. China has ramped up defence spending in recent years and is aiming to develop a navy capable of defending its growing interests as the world’s second-largest economy. Its pursuit of sovereignty claims has rattled neighbours, although it says it has no hostile intent. Kawano said the number of aircraft Japan scrambled in response to territorial incursions last year was in line with Cold-War levels and one reason was Chinese activity. Kawano’s comments come after Prime Minister Shinzo Abe pushed legislation through parliament’s lower house on Thursday that could see Japanese troops sent to fight abroad for the first time since World War Two.